VHDL-Tool provides a language server for the VHDL hardware description language. 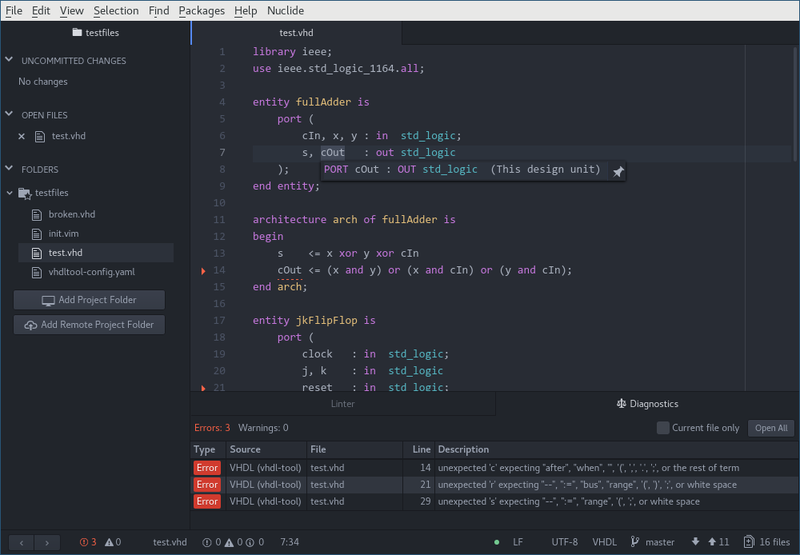 Using atom-languageclient, this plugin makes VHDL-Tool's language server interface available from within Atom. This is beta quality code. Report bugs here: https://git.vhdltool.com/vhdl-tool/vhdl-tool/issues. To use this plugin, you must first download VHDL-Tool. See the requirements section. For now, only Linux is supported. Download the vhdl-tool binary from here, make sure it has execute permissions, and put it somewhere in your $PATH. Create a vhdltool-config.yaml configuration file for your project by following the instructions here. Install the language-vhdl Atom plugin. (Optionally) install nuclide. This package depends on Nuclide for a lot of its functionality and it should be installed for the best experience. Launch Atom and open the folder containing the configuration file created in the previous step. See also the instructions here. The go to definition and find references commands are not accurate in the presence of overloading. In the case of multiple overloaded identifiers with the same name, the type correct one may not be chosen. No VHDL 2008 support yet. Initial beta release of VHDL-Tool.